What’s that noise? Homeowner Jim Fogarty would say “nothing.” That’s because he recently had Eyman Plumbing install ductless heating and air conditioning system in his old home. Fogarty made the decision to go ductless after he lost a couple of his air conditioner window units. He asked Eyman if any new technology was available and that’s when he found out that Mitsubishi had something called a ductless system. 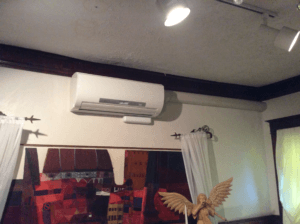 “And I said that might be for me because my house was built in 1908 and it was definitely cheaper for me to get a ductless system than have ducts put into my home,” explained Fogarty. In 1908, heating and air conditioning were after thoughts. Fogarty said it would’ve cost him six figures to install ducts throughout the house. For substantially less he said he got a wonderful heating and air conditioning system on two levels of the house. There are two outside units at Fogarty’s house, both of which are heat pumps. The heat pumps feed three interior units on the first floor of the house and two interior units on the second floor. “There’s room to expand the number of interior units but with only two of us living here, it’s enough,” Fogarty said. Each unit is a white appliance that sits near the top of the ceiling and is fairly small. He explained each one is controlled by a remote that you use to set the temperature in each room. Once you select the temperature, it’s only a matter of minutes before the room is heated or cooled to that temperature. “It’s nice because you can keep one room toasty in the winter and keep the others lower or turn off the units in particular rooms,” said Fogarty. The other feature Fogarty loves is the sound of silence. He calls it a welcome change from the noisy window units he used to have for air conditioning. When he used to turn them on all you could hear was the blower and the unit. It was hard to have a conversation. 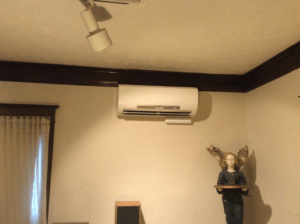 With his new ductless system, he turns the units on and hears nothing. They’re incredibly quiet. Fogarty was a lifelong customer of Rybin Plumbing so he called them when he was ready to make a change to his window units. They gave him the Eyman phone number. “A salesman and a technician came out and walked throughout the inside and outside of my house and two days later we had a drawing of where they were going to put the units and what they were going to look like,” explained Fogarty. Eyman installed the system while Fogarty and his wife were on vacation. When they got back it was all ready to go. He said the interior units are constantly looking for hot or cold spots in the room, and then turns the baffles toward those spots to ensure every corner of the room is the same temperature. Fogarty said it’s such an even system. Fogarty asked for a couple of adjustments after the system was in and Eyman made them right away. “I would highly recommend working with Eyman. I think my utilities will be a lot better in the future,” said Fogarty. Interested in a ductless system for your home? Call us today at 402-731-2727.